ADELAIDE, Australia (AP) Playing for the fourth consecutive week, Katherine Kirk wasn’t showing any signs of fatigue after shooting an 8-under 65 at Royal Adelaide to take a two-stroke lead after the first round of the Women’s Australian Open on Thursday. The Australian player birdied four of the first five holes on the front nine and three of four in the middle of the back nine at Royal Adelaide. Tied for second with 67s were Marissa Steen and Jane Park of the United States, South Korean Chella Choi and Min Lee of Taiwan, who was the only afternoon golfer to make any inroads on the leaderboard. Canada’s Brooke Henderson was four strokes behind after carding 69. Michelle Wie, using a new putting grip and stance over the ball on the green, shot 70 and No. 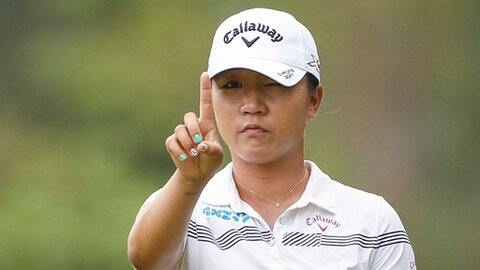 1-ranked Lydia Ko had a 71. No. 2-ranked Ariya Jutanugarn of Thailand, the LPGA’s player of the year and a five-time winner in 2016, shot 72 and defending champion Haru Nomura of Japan had a 75, both in tougher afternoon conditions when the wind increased and the greens firmed up. Ko was frustrated on the greens, but ended the day on a good note when she birdied the ninth, her last. Five-time champion Karrie Webb had a 76. She was 3-over after bogeying the first hole – her 10th – but then went double-bogey, bogey, birdie, birdie, par to complete her round. ”A couple of late birdies at least made lunch taste better, but it wasn’t real good out there today,” said Webb. Steen was in the first group out, and took advantage of it during her round which included an eagle on the third.